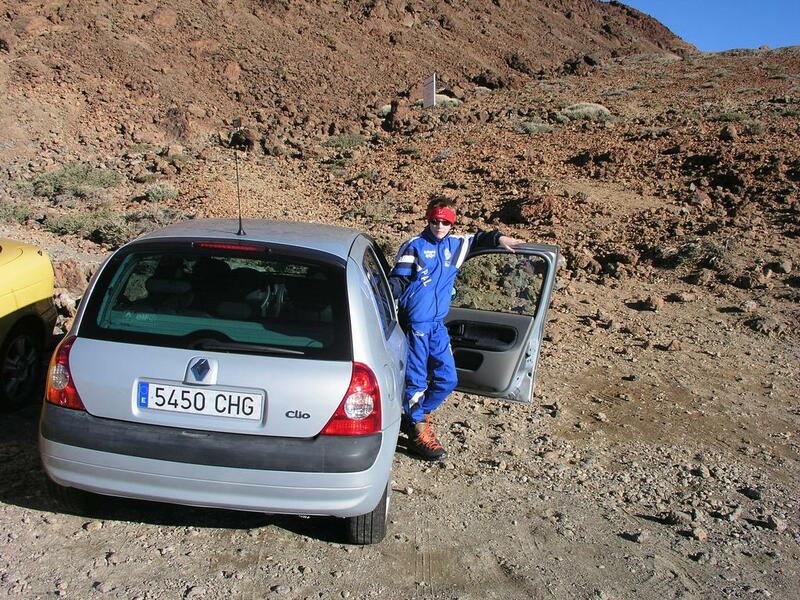 How to get there: First, fly to Tenerife, there are two airports both will do ok.
Second, it is best to have a rental car since the climb involves several visits to different locations on the island (see below). Third, get a road map of Tenerife, we stayed in Los Cristianos south-west on the island, from there the drive is about one hour. 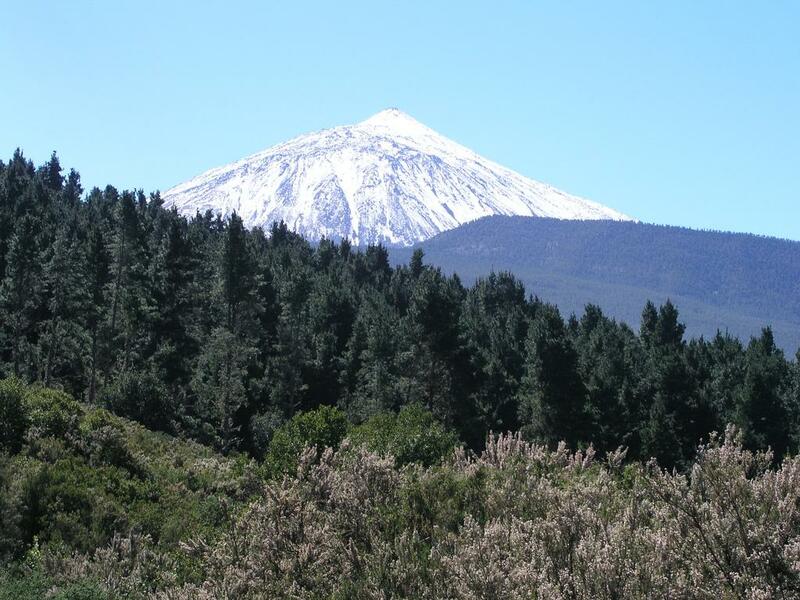 There is one road going through The National Park del Teide, the trailhead is north-east of the "Teleferico" (a gondola service that carries people high on Teide). That is, the trailhead is about 3 km in the direction of Puerto de la Cruz from the Teleferico. The trailhead is located at North 28:15.572, West 016:36.197, elevation 2360 meter (GPS measurement). This is between kilometer marker 40 and 41, approximately at 40.3 kilometer. There is parking for about 10 cars, do not block the jeep road that starts out from the trailhead. Route description: The following trip report should also serve as a reasonable description of the route. 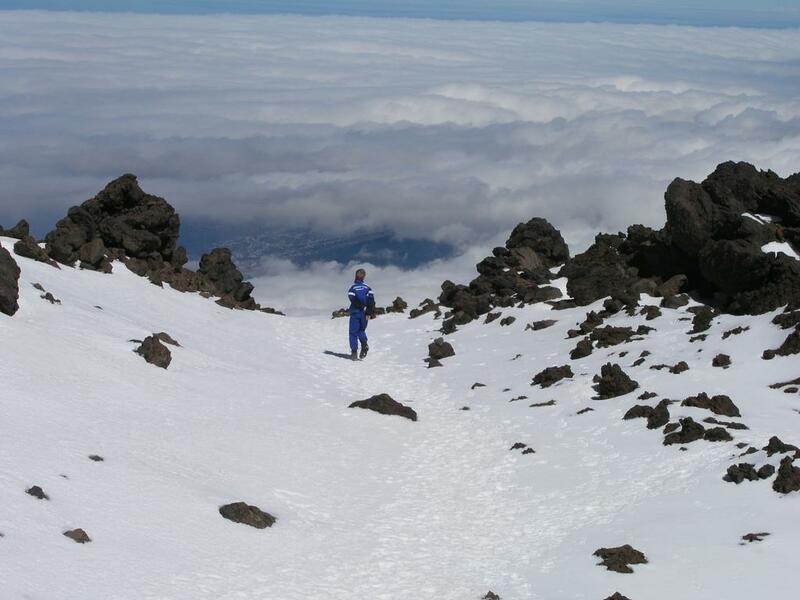 The climb of Teide requires a written permit. Officially, this is in order to reduce environmental impact on the summit area. The permit application procedure is now handled using the internet. You should first link to this page. There should be sufficient information to complete the reservation process there. Please note that you may have to apply quite a long time before your intended climb. Old procedure, please note that it cannot be used any longer! This section is retained for historical reasons. The climb of Teide requires a written permit. Officially, this is in order to reduce environmental impact on the summit area. It seems like the park authority thinks that the best way to accomplish this is to make the permit very difficult to obtain. More on this below. Thanks to a very good description by Endresen, we had little difficulty. For completeness, we essentially repeat his description here (Credit for the 3 next pictures is all his). 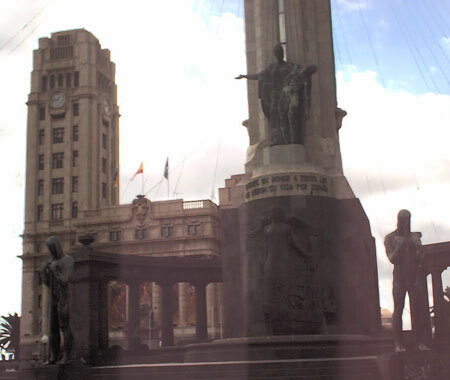 First, go to the main city on Tenerife, Santa Cruz de Tenerife (north-east on the island). Locate Plaza de Espana with the town hall tower. There is a large underground parking garage just south with access from a street that runs from the sea and uphill. Walk across the lower end of the plaza away from the tower. Your view should look like this. Continue straight ahead until you locate the fourth road going left. 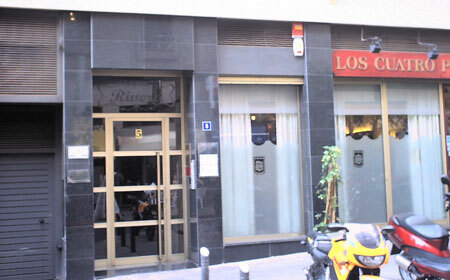 This street is Calle Emillio Calzadilla, there is a Bang and Olufsen store on this corner. The street number is 5, this is the third numbered access on your left side of the street. The door looks like this. There is not a single sign indicating that you are at the right place, quite incredible. The office is located on the 4th. floor (counting from zero), ring the bell. When we were there, nobody bothered to open despite repeated, intense ringing. The office is supposed to be open from 0900 to 1400 on ordinary weekdays. (The complete address is: ICONA, Office P.N. de Teide, Calle Emillio Calzadilla 5, 38002 Santa Cruz de Tenerife. Phone numbers: 922290129 or 922290183). Fortunately, somebody exited the door thereby providing us access. At the 4th. floor there is a sign telling you that you have indeed found the National Park office. The person behind the desk will immediately ask for a photo copy of your passport. He is, in fact, not interested in the original. There is no photo copy service available, thus it is important to know this and bring a copy with you. The permit is free, one person is designated the leader and the passport data for additional people in the party is written down on the permit form. Perhaps even more unreasonable, you are asked to specify the date and a precise two hour interval in which you intend to climb from the top station of the cableway to the summit. I asked if the permit could allow for say, two different days, but no. If we did not climb in the specified two hour slot, then we could always come back to the office and secure a new permit! We picked the next day, March 2nd. and estimated that the interval from 1300 to 1500 would allow for a reasonable climb to the top station. All members of your party must bring their passports on the climb, the idea being to check this information and the permit as you reach the top station of the cableway. Second, the map: As often is the case, it is next to impossible to find a place that carries and sells topographical maps. Again, the advice of Torstein Endresen was excellent. Hop in your car, leave Santa Cruz de Tenerife and drive to the opposite side of the island, to the town called Puerto de la Cruz. 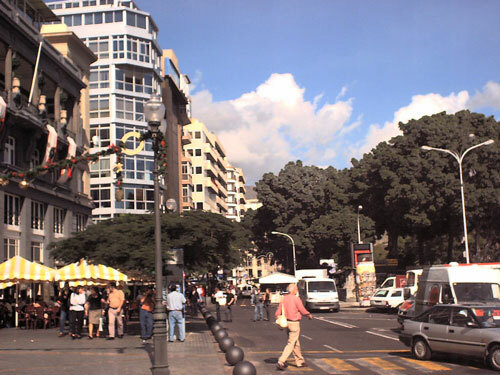 Locate a shopping centre (Centro Commerciale) near Playa Martianez, more precisely between hotel San Felipe and Orotava Palace. There is an underground carpark on the street parallel to the street of the shopping center. Right inside a second floor entrance, you will find a small bookstore (actually more like a newspaper store). At the far end, this little store carries a good selection of topo maps. 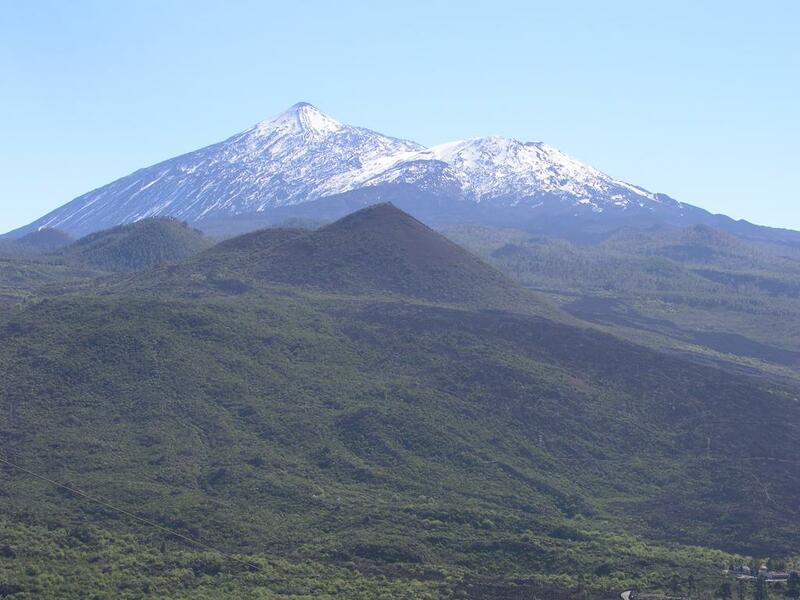 The national park is covered by 4 maps, however, the climb of Teide is all within map number 1091-IV, called La Montaneta. The map is in scale 1:25.000 with 10 meter contour interval. In order to do some additional hiking on the rim of the caledra, one should also buy map 1096-II/1097-I, called Las Nieves. Third, the climb: We drove through the national park on the way home from our trip to Puerto de la Cruz. We located the trailhead, parked and made a quick hike to the summit of Montana Blanca. I was surprised by the amount of snow, in fact, snow covered the mountain all the way down to 2400 meter. Moreover, the snow was pretty hard, obviously frozen from last night. It sure looked like an ice axe and a pair of crampons would have been nice to have for a climb more than 1000 meter higher. Well, at least we brought good Scarpa mountain boots, they would surely do much better than today's jogging shoes. We took a clear trail that left the main trail and headed straight up towards the top of Montana Blanca, loose gravel and hard snow. 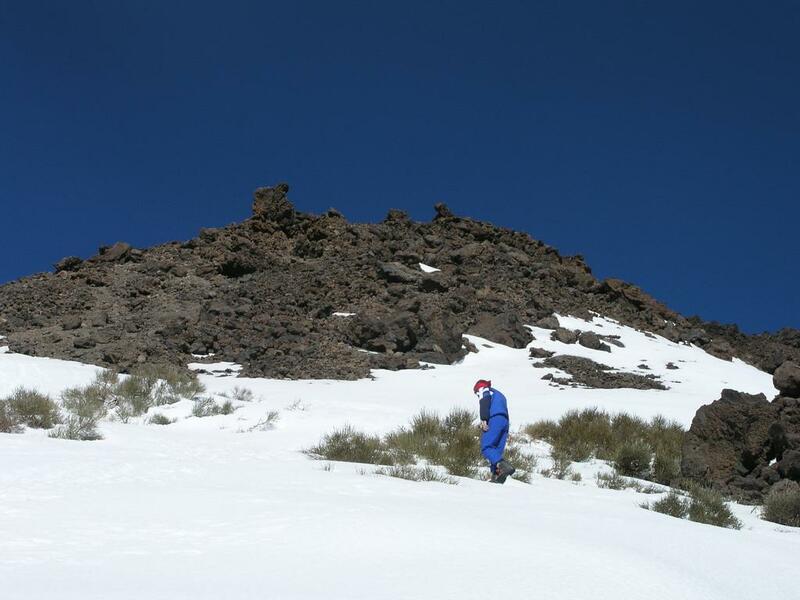 The "summit" is located at North 28:16.139, West 016:36.845, however this is nothing but a low shoulder from Teide itself. My GPS gave an elevation reading of 2770 meter, this is surprisingly higher than the map elevation of 2748 meter. The primary factor was measured the next day to at most 30 meter, likely a bit less. Satisfied with the day, having secured a climbing permit for the next day, having purchased topo maps and having carried out a small test hike from the proper trailhead, we returned to sea level and our hotel. We left our hotel in Los Cristianos at 0800, arrived at the trailhead at 0900 and started hiking about ten minutes later. The route follows a jeep road (closed to traffic) that contours on the east side of Montana Blanca for about 2 km until near the gully that separates Montana Blanca from the main bulk of Teide. Next, this road climbs very gently in several switch-backs on the Montana Blanca side until reaching the same gully again, this time very near the saddle between Montana Blanca and Teide. 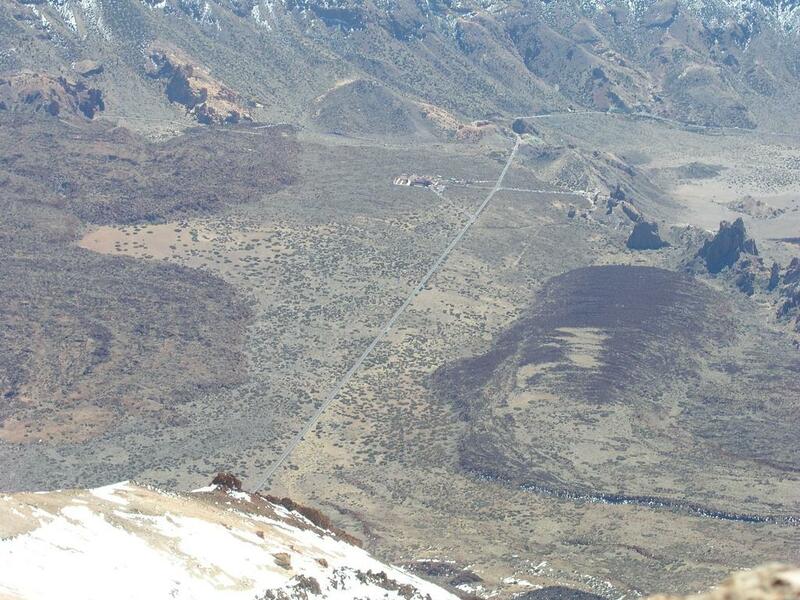 This point has several (ugly) warning signs telling hikers that it is forbidden to climb the summit of Teide. From here, a smaller footpath zig-zags up a gully that comes down from Teide proper. The location is north 28:16.241, west 016:37.053, my GPS gave an elevation reading of 2740 meter. The map indicated a primary factor of Montana Blanca closer to only 10 meter, a visual estimate seemed more in agreement with the GPS. The route continues uphill at a somewhat steeper angle, the path looked quite good, however it was largely buried under snow. Higher up, the trail goes by some larger rocks, then continues up a shallow gully. 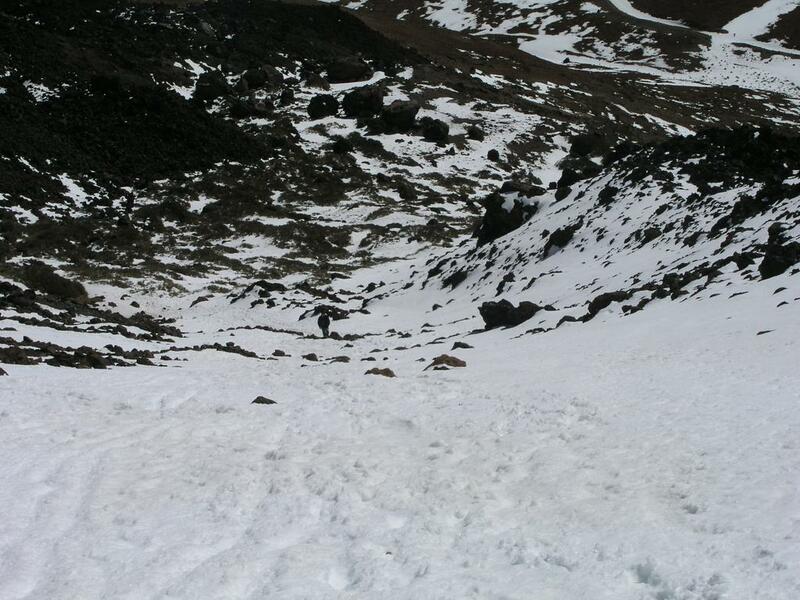 This section was the steepest part of our climb, a snowfield with fairly hard snow. Our boots kicked sufficent steps, but with only slightly harder crust one would have needed crampons here. This slope (looking down) was steep enough that a fall and a possible subsequent slide could have been dangerous without any means to provide a self arrest. In the summer, there is likely a very easy switch-back trail going up this gully. Higher up, the trail exits the gully to the right, continues up on a more gentle angle, then heads somewhat more to the climbers left before reaching the mountain hut, Refugio Altavista. My GPS showed elevation 3280 meter and location north 28:16.442, west 016:37.758. This hut was closed, but we rested outside for about 15 minutes in the nice sunshine. Beyond the hut, the route continues uphill, but with a very gentle slope. 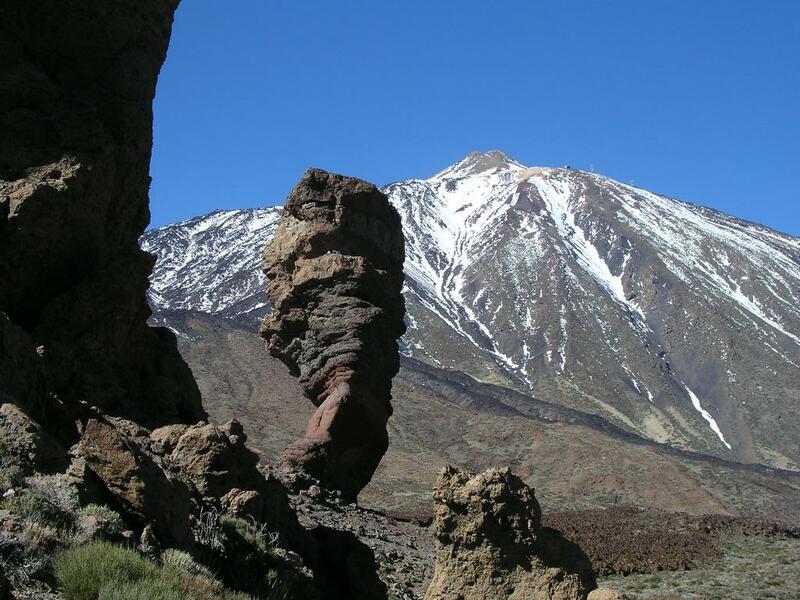 Gradually, the route traverses more to the climbers left and the top summit cone of Pico del Teide comes into view straight ahead. We arrived at the top station of the cableway and tried to find an official ("ranger") that was supposed to check our climbing permit. No such luck. They had closed off the building with a couple of viewing platforms, obviously they did not want any "tourist" as much as a single step off the building. Eventually, somebody went and located a ranger, this guy did not seem to be very competent on mountains or mountaineering. He lectured a long list of unsubstantiated arguments about how "extremely dangerous" the summit climb would be and that we rather give up the idea. I do not think he had a clue on how the conditions from the base of the mountain to this point was nor the fact that we actually had hiked from the base. In any case, we set off for the final part of the climb, ignoring the ranger, as it seemed clear that our permit would prevail over his warnings. Somewhat to our surprise, this final part was a well made path, clearly very resistant to erosion as most of it consisted of slabs of rock that had been put nicely in place to form the path. This final section was probabely the easiest part of the climb since we left the jeep road near Montana Blanca. Overall, in summer conditions this climb is (YDS) class 1 in difficulty, that is, a nice and well developed trail all the way. 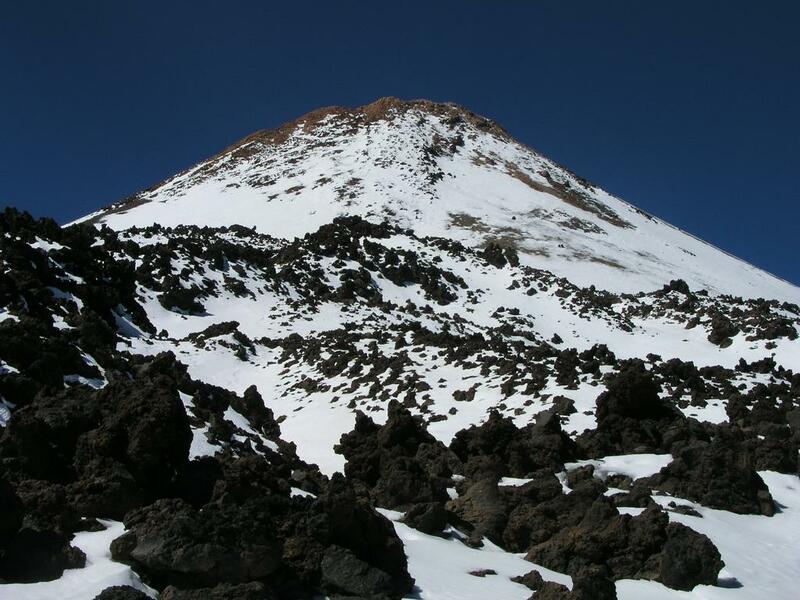 In winter, weather permitting, this peak can be climbed quite easily with an ice axe and crampons. 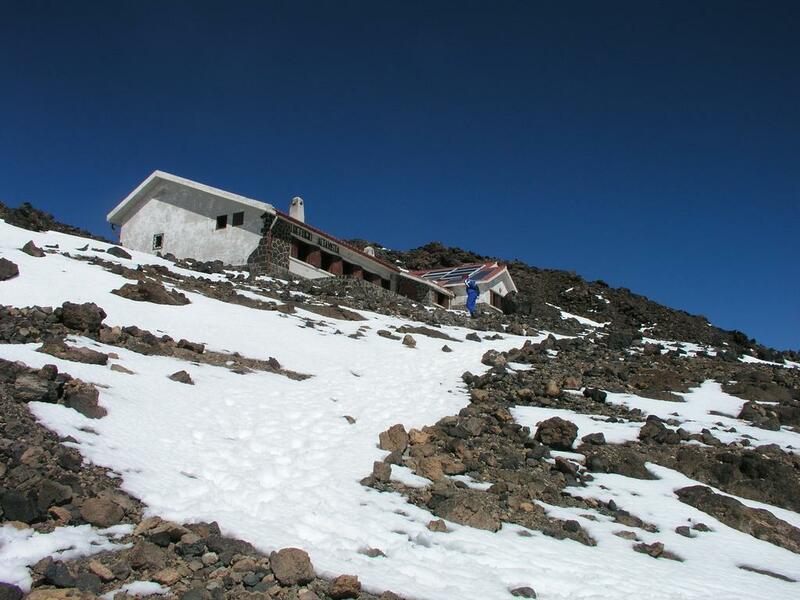 Our climb would be class 2 due to the moderate snowfield below the Refugio Altavista. We quickly gained the highest point, took pictures and enjoyed the 360 degree panorama. The higher part of the island Palma was visible above the clouds to the west. Clouds were backing up on the west side, sulphur came out of the shallow crater. We really needed the breeze in order to ventilate some of the bad smell. We sat down a few meter below the summit and had lunch, good appetite as we ate and drank while talking about the caldera below, the nice straight part of the road and many other details that caught our attention. All good things come to an end, after about 45 minutes we descended from the summit cone and proceeded directly down towards Refugio Altavista. 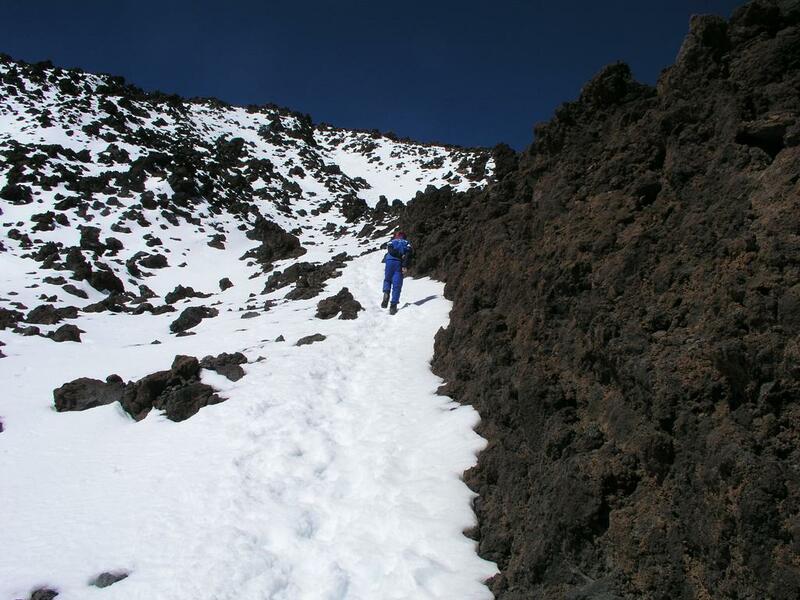 Below the refugio, the snow was already much softer, and I fell through into deep holes between the volcanic rock in several places. Such conditions require care, since your leg may suffer injury or one may experience a sudden fall forward that may be dangerous on a downward slope. Despite of this, we moved quickly and were back at the trailhead in less than 2 hours. 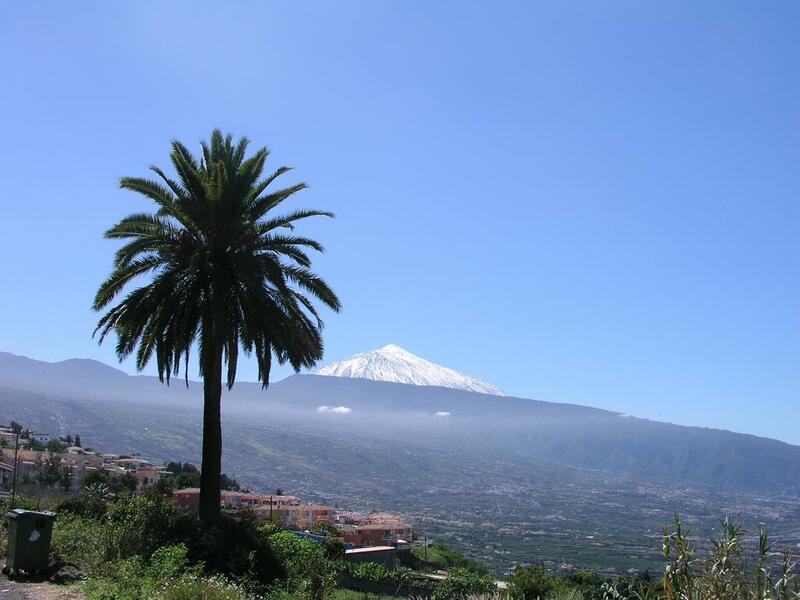 Having made it to the island of Tenerife one should not only climb Teide. Information on some other mountain hikes that we did is also available. Comments: I did this climb with my son Pål Jørgen, age 14. We started from the trailhead (car park), at 0910, arrived at the saddle between Montana Blanca and Teide at 1010, made the hut, Refugio Altavista after 2 hours at 1110. We had a 20 minute break there before proceeding to the top of the cableway, arriving there at 1230. 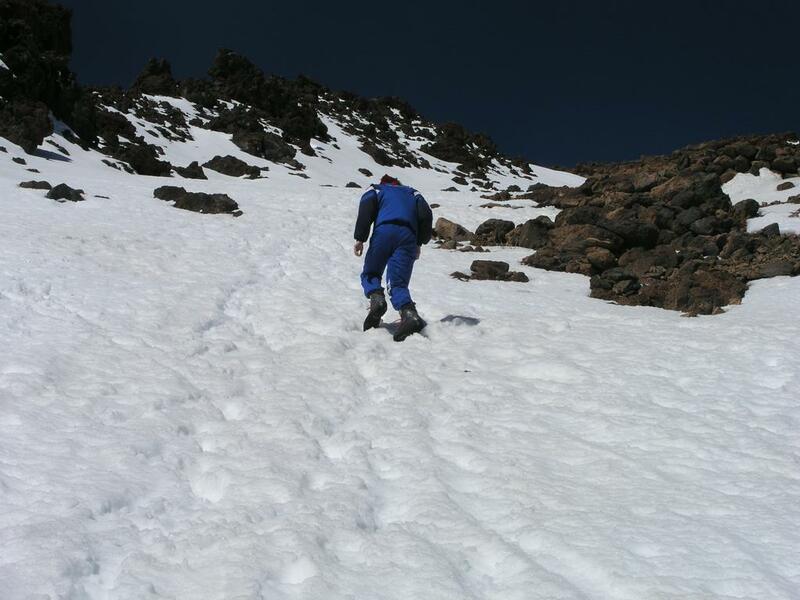 We proceeded with the final summit climb at 1240, arriving at the summit at 1300. We spent about 45 minutes on the top enjoying the spectacular views in all directions, before descending and arriving back at the gondola top station at 1400. We then descended along the same path as our ascent, arriving at the car at 1540, 6.5 hours after our departure. Concerning the "red tape", this peak indeed has a bigger share than most mountains. Erosion is potentially a much bigger problem along the trail from the base to the top station of the cableway, than from this point to the summit. Hikers are confronted repeatedly with UGLY metal signs telling that to climb El Teide is illegal. However, it is perfectly legal to climb all the way to the top station without a permit, while the last stretch, with much less erosion problems due to the good trail, is illegal. Tourists can drive from sea level in one hour, then take the gondola (cableway) to 3500 meter in 10 minutes. One can imagine that many tourists could be poorly equipped and also at a high risk of AMS (Altitude sickness), if allowed to climb the last couple of hundred meter vertical to the summit. Thus, it seems to me that one could avoid a lot of trouble, reduce the red tape and improve the reputation of the park management, by allowing people to climb the mountain from its base without any permit system. The effort required would serve as a natural limitation on the total number of climbers. A bonus would be the removal of the ugly signs that have been put up. 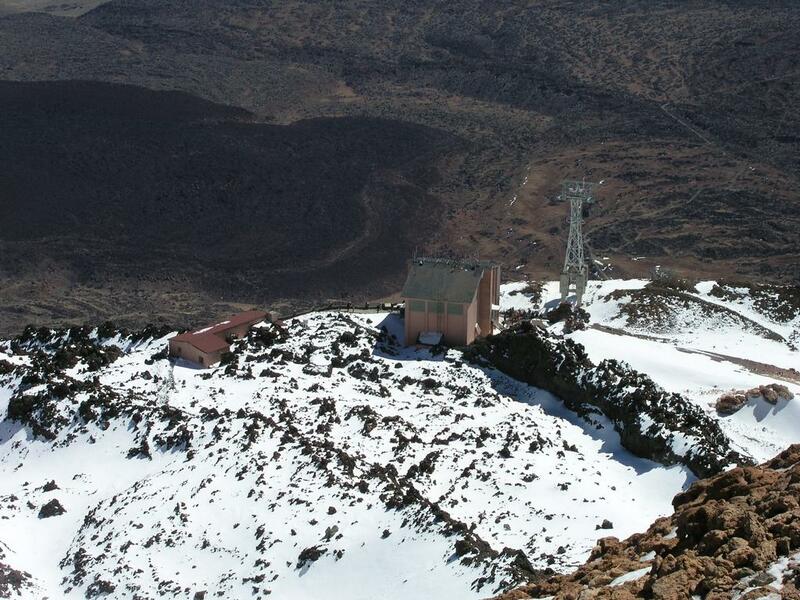 People riding the cableway should be informed that they can only visit the viewing platforms on the top. 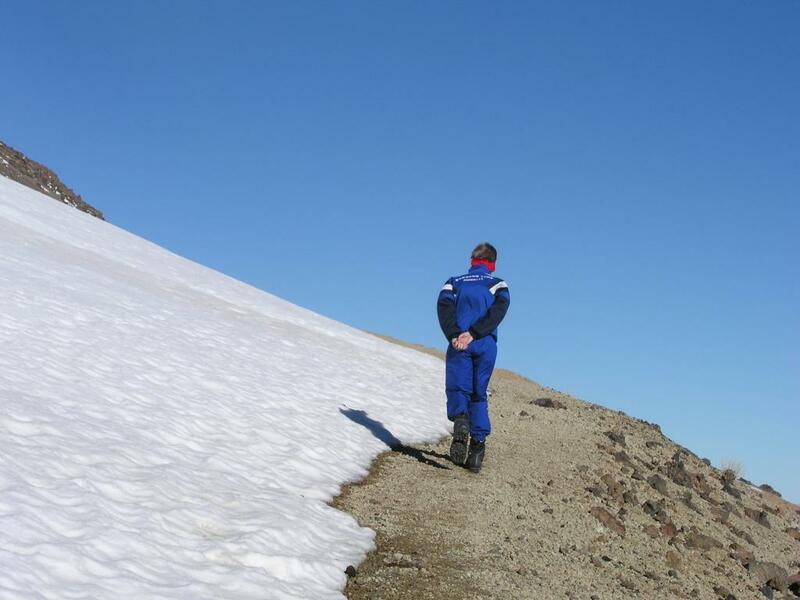 In the winter months, erosion is minimal as hikers climb on the snow surface almost all the way. In the summer, what looks like a well developed trail plus a few reminders that hikers should stay on this trail would contain the problem. In any case, once a party has a permit to climb the mountain (from its base), it seems highly buraucratic and serving no purpose to insist on a two hour slot for the summit. Presumeably, climbers will only visit the summit once and the entire climb would be more enjoyable without such stupid stipulations. After completing this climb, I picked up the guide book, "Tenerife", in the Rother Walking Guide series (by Klaus and Annette Wolfsperger, published in 2002). This book seems well informed and provides information about 50 walks and climbs in Tenerife, including a good description of Pico del Teide. The caledra rim and Pico del Teide, from the east when leaving Tenerife. 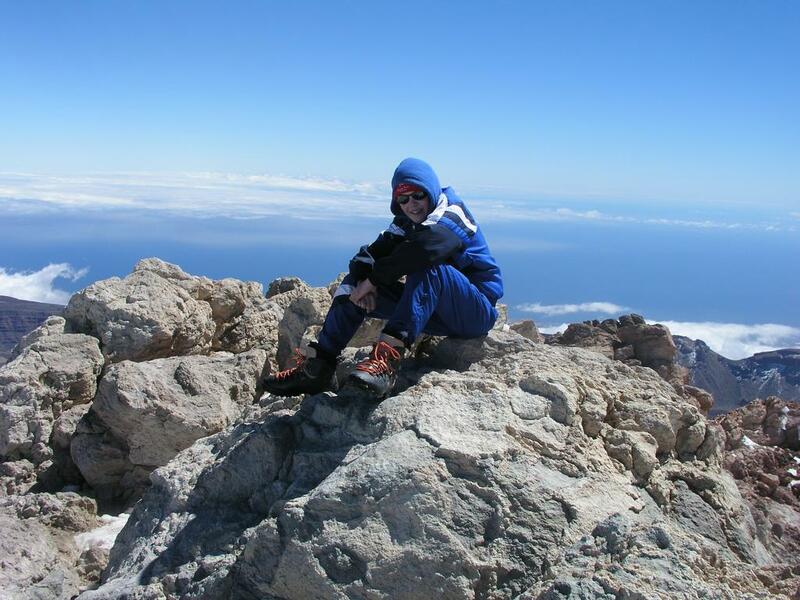 On the summit of El Teide, Pål Jørgen enjoys the view. Panorama view from the summit, north towards north-east. Clouds are pressed against the slope. Puerto de la Cruz on the coast. Panorama view continued, north-east towards south-east. The caldera and the lower rim. The east coast is visible behind Topo de la Grieta rightmost in the picture. Panorama view continued, south-east towards south-west. The caldera and the peaks on the rim. El Teide behind Roque Cinchado, the most famous rock in Roques de García (called the finger of God). El Teide from the west, from Cherfé Pass (about 1100m), between Santiago del Teide and the village of Masca. El Teide from the north-east, from Puerto de la Cruz on the north coast. El Teide, from the road going from Puerto de la Cruz to the base.